The strong German Macro data supported EUR but there were no major economic reports in the US to empower USD. Trump and Merkel support the EU-US trade talks which will give strength to EUR. 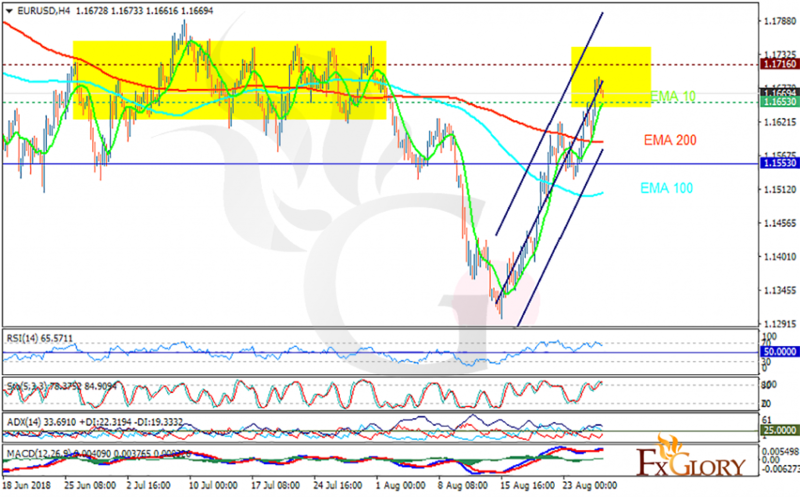 The support rests at 1.16530 with resistance at 1.17160 which both lines are above the weekly pivot point at 1.15530. The EMA of 10 is moving with bullish bias in the ascendant channel and it is above EMA of 200 and the EMA of 100. The RSI is moving in overbought area, the Stochastic is moving in high ranges and the MACD line is above the signal line in the positive territory. The ADX is showing buy signal. 1.16 to 1.17 was an important area in June and July and now EURUSD has reached this level again which might find some support. Still bulls control the chart and the price may grow towards 1.175.